With the Meclift ML4212RC variable reach truck, you can take your heavy-lifting operations to the next level on efficiency and safety. 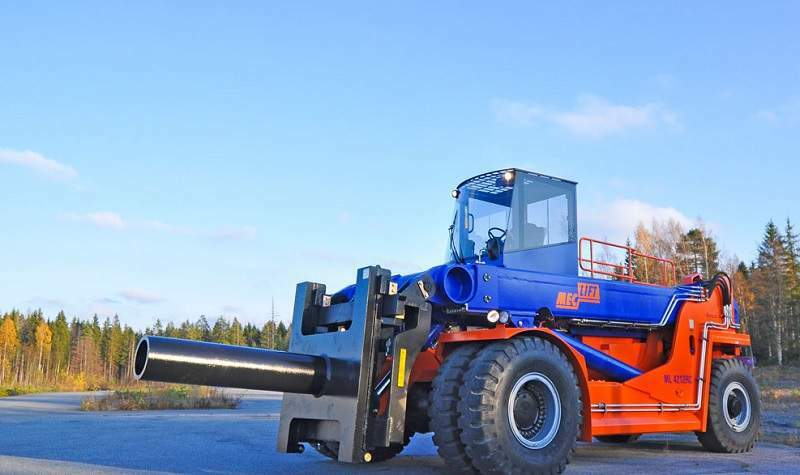 ML4212RC is capable of lifting 42t with a 1.2m load centre, can reach up to 3.25m and take the lifting height as high as 7.8m. It is superior compared to conventional forklift trucks. With high-reaching capability, Meclift ML4212RC excels on loading and unloading materials to containers. Our telehandler can reach to the end of a standard 20in container and still lift 13t, making all logistical manoeuvres significantly easier and safer. The ML4212RC variable reach truck is designed to help with container loading and unloading, you can do all the heavy lifting into/out a container, that is located on top of the trailer. With bogey rollers, you can load cargo up to 30t in the middle of a 20in container. With the lifting beams, ML4212RC is an unique combination for long and heavy object handling. With that, it is possible to place rods, pipes and tubes into middle of a 40ft container. There is no other machine in the world that can do that. With the vertically movable cabin, the driver can position him/herself in the right place to see either the forks or surrounding areas, whichever is needed at the moment. This makes it much safer to operate the truck. To improve safety, ML4212RC can be fitted with cameras at both its front and rear.